The retiring list was released today and thankfully, the cat punch is NOT on the retiring list but lots of other great items are….you need to pick them up before they are gone! Stamps will be available thru Dec 21st but all accessories are only available while supplies last so DO NOT WAIT! I will remind you of the Builder Framelits from this past spring…it went fast and I had a lot of disappointed customers and downline…so take that as a lesson learned and not wait. One of the items that was included in this Holiday catalog is the 12×12 cardstock in a single color. I stocked up on Pumpkin Pie #145483 12×12 as it's perfect for Halloween and Fall. We carry some colors of 12×12 in the Big Catalog but it's nice to have 24 sheets of a single color! 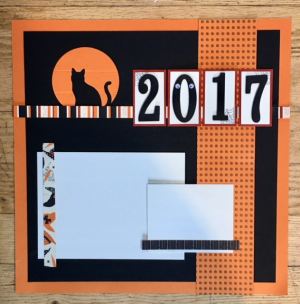 The Spooky Night paper in this layout is also retiring as are the coordinating dies. 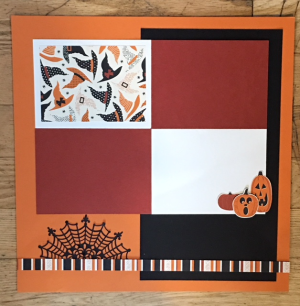 Isn't this cute…the framelits from the Patterned Pumpkins will cut out the pumpkins from the paper. So if you have a scrapbooking retreat planned (hint, hint – we have a retreat coming up on Jan 20th (Camp Stamp-in-Oga) and my Gathering in the middle of Feb) you will want to stock up on all these items so that you can scrapbook some of you fall and Halloween photos. Here's one of the layouts that my Layout Class peeps did back in October. I do have a couple of extra packets available for purchase. Simply email for more information. Retiring List – While Supplies Last on Accessories.